I once owned a farm in West Virginia and in late winter we collected maple sap to make our own syrup. It started as a school project for my oldest son and we continued it. Every morning we visited the ‘sap trees’ and collected several gallons of liquid. The first year we were able to produce five gallons of syrup. We had an old incinerator in the garage to boil down our sap that we collected over a two week period. The garage was a good place for the operation as making syrup can be a messy process and the extreme increased humidity isn’t welcome in most kitchens. Forty gallons of sap are needed for each gallon of syrup, so it’s no wonder real maple syrup is expensive. Most people only collect from sugar maples (Acer saccharum), which are very rare around here. They were abundant on my farm, but we also tapped red maples. The sap from them has less sugar, but we noticed little difference in quality of the finished product. Red maple (Acer rubrum) is very common in eastern North Carolina. In fact, it has the largest geographic range of any North American tree. Red Maples grow from Alaska to Mexico. Once red maples were rarely used, but now many syrup producers routinely utilize them. Pure syrup from red maple has a slight nuttier flavor. Sap from silver maples (Acer saccharinum) can be used too. Even birch trees make fine syrup with a unique flavor. We drilled each tree to a three inch depth at a slightly upward angle. I used an old fashioned brace and bit and made our collection taps about four feet off the ground. After that, we attached short pieces of copper pipe that fit snugly about an inch into the holes. We used two or three tap sites if the trees were large. Covered buckets kept out rain and dirt. Commercially made taps are available but we fabricated our own out of materials we already had. Some people even use plastic. I always made sure to remove the taps every year as copper can be phytotoxic over extended periods. The best time to tap trees is when day temperatures are above freezing and night temperatures are below. Forty degree day and 20 degree night temperatures are ideal. Our season in eastern North Carolina is shorter than in the northern sugar producing areas. Once buds start to swell yield withers and a bitter taste develops in the sap. Sugar producers call this flavor ‘buddy’ and it also makes the syrup cloudy. Once we collected our sap we placed it in large canners to boil it down, and we reduced 10 to 20 gallons of liquid every day. I loaded the large incinerator with wood in the morning and in the evening when I returned. Once liquid gained viscosity we transferred the sugary mixture to the kitchen where we could closely monitor it. Burning a batch, making a mess and negating a lot of effort were lessons we only had to learn once. 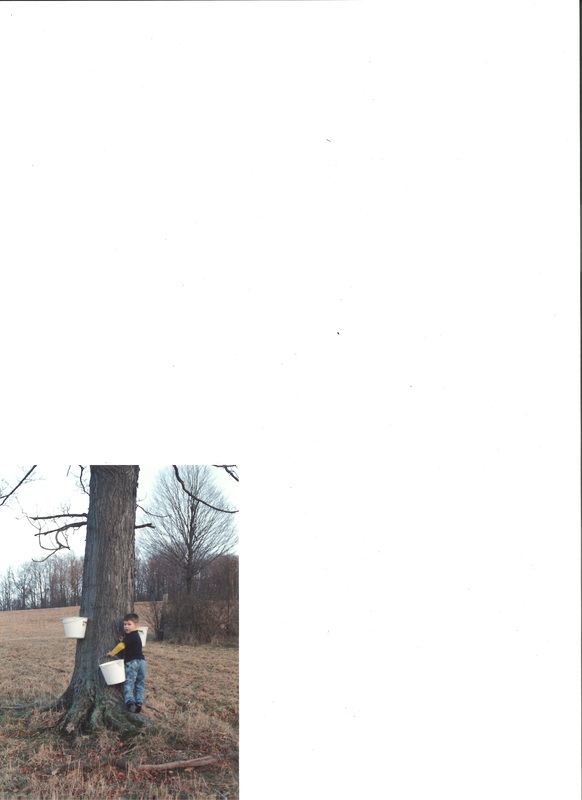 The picture below is my son Daniel collecting sap 25 years ago. Those were fun times. This entry was posted in foraging and tagged maple syrup, red maple, sap, sugar maple, viscosity. Bookmark the permalink.